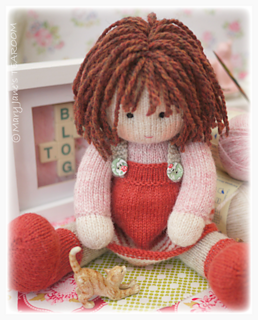 Receive a FREE copy of the ‘STARRY Doll Pinafore’ found here when purchasing CHRYSTAL. Chrystal is the ’in the round’ version of the ‘Dolls from the TEAROOM’ knitting pattern. The PDF contains 14 pages with 40 photographs. Chrystal is a structured doll with flexible joints and can adopt a sitting position with arms forward and legs splayed out. Only basic knitting skills are required to knit the fabric for your doll and the pattern contains lots of tips to help put your doll together. 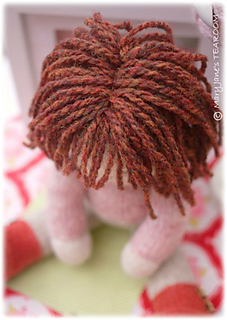 There are over 220 shades available of the yarn used if you would like to customise your doll. Materials needed have been carefully detailed at the beginning of the pattern along with useful resource links to purchase all the items for your project. On purchase you will also receive a FREE PDF for ‘A Simply Sewn Pinafore’ if you would also like to make one for your doll. 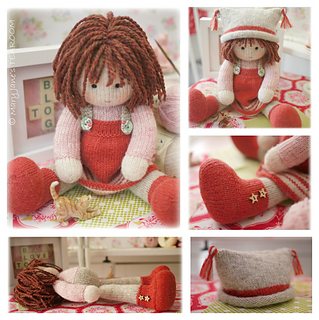 If you prefer to knit your doll flat and seamed you could do so using the original ‘Dolls from the TEAROOM’ pattern here using CHRYSTAL’s recommended yarns and photographs as a guide.